Enjoy Monterey Bay views from your Executive King accommodations. These top-floor Executive King rooms have the feel of a coastal retreat with interior crown molding and residential interiors. Complete with flat screen televisions, refrigerators, rattan chairs, work desk, iPod docking station, king bed with German high thread count linen and premium amenities, each Executive King room is well-appointed with modern touches. 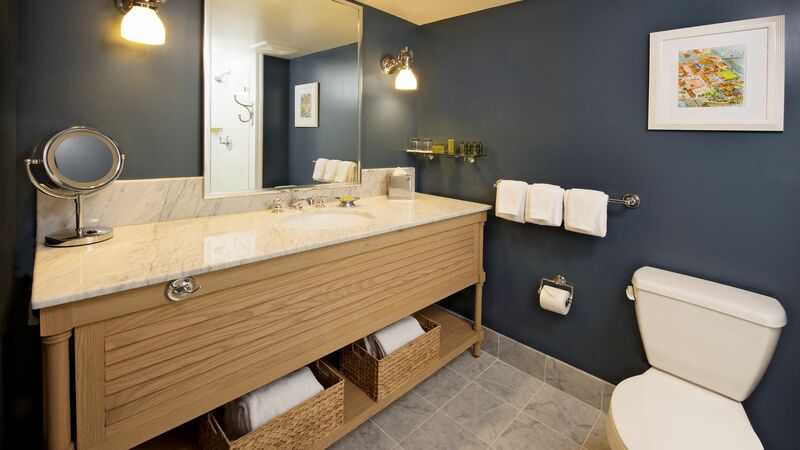 Each bath includes marble flooring, spacious showers, makeup mirrors, eco-friendly bath products and hairdryers. Access to the Executive King rooms is private and includes additional amenities. Executive King Rooms are unavailable for booking online. Please call (888) 222-5851 to book this room.